Ellie Brown, Bud Bristow, Franky Hill, and Will Ramsay. Will Ramsay is Board Chairman and Board Clerk is Rob Walker. The Board meets monthly on the second Wednesday of the month baring holidays. These meetings are open to the public. For more information on upcoming meetings or to view the minutes of past meetings, check the public meeting link on this website. ORACLE FIRE DISTRICT BOARD CEREMONY – June 12, 2018. There was a ceremony at the monthly Oracle Fire Board meeting for Dale Suter. Dale was recognized for time served as a Fire Board member from 2016 to present. He is shown here with Fire Chief Robert Jennings (left) accepting his award and his wife Catesby with cake (right). NOVEMBER 2016 – Manny Navarro has stepped down from the Oracle Fire Board as his term ended. He was given a plaque at the Oracle Fire Board meeting on Nov. 8, 2016. We would like to thank Manny for his service to the fire district and to the community. Taking his place is Dale Suter. ORACLE FIRE BOARD MEMBER – A fairly new Oracle Fire Board member is Franky Hill. Her term will be until November 2015. She is shown here being sworn in by board member Ellie Brown. Shown below is the 2015 board: Manny Navarro, Eillie Brown, Franky Hill, Bill McMurry, and Bud Bristow. Oracle Fire District's initial five-member board was sworn in on Dec. 1, 2012, at the fire station in Oracle prior to its first meeting. The first Fire Board consisted of Ellie Brown, Manny Navarro, and Charlotte Poole serving four year terms and Bud Bristow and John Doran serving two year terms. Robert Jennings was officially sworn in as the new Oracle Fire Chief at the Jan. 11, 2017 Fire Board meeting. Battalion Chief Larry Southard was appointed as Interim Fire Chief by the newly elected Fire Board on December 1st, 2012. 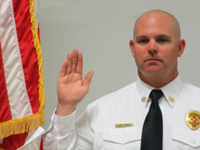 On June 3, 2013 Chief Southard was hired to fill the position of Fire Chief. Chief Southard restructured the department’s Chain of Command to consist of Assistant Fire Chief Robert Jennings; Chief of Administration, Tina Acosta; and Battalion Chief Brian McGinnis. "The Oracle Fire Department has been served by a two person board since Feb. 14, 1966, so this is a very historic event for us and we are very excited to work with the new Fire Board," said Chief Southard.